Michael Macht doesn't foresee VW Group exporting China-built cars to Europe anytime soon. The Volkswagen Group is growing fast and is struggling to meet the huge global demand for its vehicles, Michael Macht, VW production chief said in an interview with Automotive News Europe's sister publication Automobilwoche. In the interview, the VW executive talked about the demand for vehicles in China, the group's expertise in component manufacturing, raw material prices, and the recent wage agreement made between Volkswagen and its work force in Germany. Mr. Macht, are there opportunities to construct a completely new VW Group plant in Germany? The market tends to be growing more in other regions of the world and we are responding to that by increasing capacity in China, for instance. Our strategy is to satisfy customer desires with regional models that are locally produced. Another reason for this is that we face a variety of trade barriers or customs duty limitations around the world. Cost structures result from these constraints and make it impossible to easily deliver around the world. But clearly if the European market were to grow in a way that made it necessary to create more capacity, then why not? Could the VW Group's vehicles one day be exported from China to Europe? The entire industry is mulling this question. At the moment, every car that we produce in China is needed to meet demand in the Chinese market. We are not even keeping up. The additional capacity of our two new China factories, which are due to start up in 2013, is already completely scheduled for the local market. Therefore, I see no possibility that we would export from China to Europe for the foreseeable future. What time frame is considered "foreseeable" in the VW Group? We work on the basis of our planning meetings, and at Volkswagen each meeting looks ahead five years. With the high global demand for our products, we in manufacturing have to stretch ourselves to achieve what the sales department demands from us. 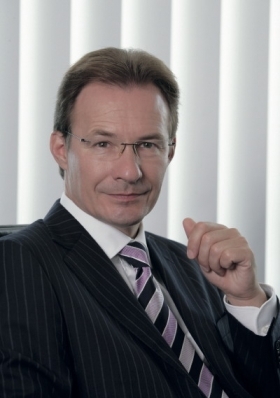 Former VW brand chief Wolfgang Bernhard wanted to sell a large part of the company's component-making business units. Are you happy that VW kept them? The business area for components has functioned very successfully for years. It is profitable and is competitive both financially and in terms of innovation. During the past few years, our capability for in-house development has been systematically strengthened so that important products such as APA (axially parallel actuation) steering from Braunschweig and the dual clutch transmission from Kassel are delivered worldwide. Even the core components of the e-Up, VW's first purely electric car, will be sourced from our own manufacturing network. The battery system is coming from Braunschweig, and the electric motor from Kassel. These facilities had to stand up to a tough "make-or-buy" process. You mean insourcing versus outsourcing, right? Yes. The factories developed the breadth to secure their future, in tough comparison with external suppliers. This means they are extremely competitive in terms of their cost structures and manufacturing processes. And they are innovative and creative, because they are mastering these new technologies as well. In your business area, what areas show the greatest potential to develop? For example, could you start providing contract manufacturing to competitors? I can rule out contract manufacturing for our competitors. We have to make sure our factories to can handle the expected growth in the volumes that we foresee worldwide. How are they dealing with rising raw materials prices? Volkswagen developed suitable strategies early on to minimize the risks of volatile raw materials markets. One focus is on the strategic alignment of our supplier portfolio. In addition, were are working hard to reduce scrap and work as efficiently as possible. We want to reduce the quantity of shavings in production. We want to minimize rejects. It's also necessary to reduce waste, in packaging, for example. What approach in the reduction of energy use in production do you consider to be especially promising? At our new factory in Chattanooga, we have configured a large portion of the lighting as LED technology. For example, LED in the exterior and partly in the interior, with a significantly lower electric power consumption in each case. And we are becoming significantly more efficient in our painting processes. We continue to grow at other facilities as well. For example, our new stamping plants will have servo-presses, which have recuperation. With a press, you first have to raise the die, and that costs energy. In its movement downward and braking, we can recapture a part of that energy, since the new press lines have servo direct drive with highly dynamic torque engines. There is great potential here. What do you as production chief have to say about the recently concluded wage agreement at VW? This deal sets a trend and does complete justice to the performance achieved especially at Volkswagen in the overall economic climate of the past two years. The commitment that the team has shown here is very impressive. I am filled with pride at how everyone, from top management to the assembly line, has extended himself to meet the high demand and put cars on the road.